Born Milwaukee, Wisconsin, February 3, 1960; married; 4 children. Graduate New Berlin West High School, 1978; B.A. in Business, University of Wisconsin–Whitewater, 1983. 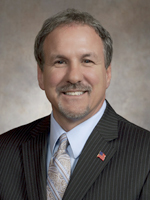 Former member: Wisconsin Restaurant Association (president); Wisconsin Bowling Centers Association (president); New Berlin Chamber of Commerce (president).